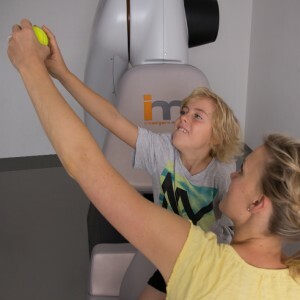 The hirob rehabilitation robot enables unique movement therapy for the improvement of trunk control and stability in patients with neurological deficits. The hirob simulates the path of motion as it would result from a horse’s walking movement and thus enables automated hippotherapy to be conducted. During the full duration of therapy, the patient must actively react to the robot’s movements. As a result, trunk stability and balance are improved. A Class IIa medical device in compliance with Council Directive 93/42/EEC. Therapy involving the hirob produces: – increased activity of the trunk and back muscles – enhanced selective pelvis movement – improved ability to maintain a straight pelvis and upper body posture – improved trunk stability – improved static and dynamic balance This can be achieved by the dynamic, three-dimensional movement of the robot and the device’s seat which is shaped like a natural horse’s back. 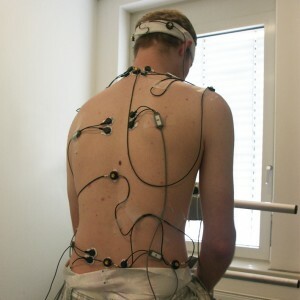 During the full duration of therapy, the patient must actively react to the robot’s movements. Additionally, therapy may be supplemented, e.g. by the therapist throwing a ball for the patient to catch, the patient reaching for a hoop or stretching exercises involving a therapy stick. Individual movement patterns for various pathologies or therapy phases may be provided upon request in order to further increase the therapy’s efficiency for the patient. In addition to the movement profile, the intensity and speed of the movement may be adjusted continuously to the patient’s pathology, convalescent stage or condition on a particular day. The hirob features a therapy seat shaped like a horse’s back which supports the patient’s ability to maintain their pelvis, and, consequently, the upper body, in a straight posture. Furthermore, muscles shortened by the usual sitting position are gently stretched and the flexibility of the hip joints is enhanced. A straight trunk posture, improved trunk stability and regulated muscle tone also have a positive effect on manually conducted physiotherapy and ergotherapy. At times, exercises may be conducted more effectively and at an earlier stage in the overall therapy. In order to evaluate therapy involving the hirob, a clinical study was conducted under the direction of Associate Professor Dr. Leopold Saltuari and Dr. Andreas Mayr at Hochzirl Hospital. Twelve patients with neurological defects which occurred following a stroke or traumatic brain injury took part in the study. Out of 12 patients, 11 showed significant improvements in terms of trunk stability, as well as increased back muscle activity, enhanced ability to maintain the pelvis and upper body in a straight posture and an improved selective pelvic movement. Compared to conventional hippotherapy, therapy involving the hirob is also more attractive for its lower operating costs. Only one therapist is required to conduct the therapy and to transfer the patient. 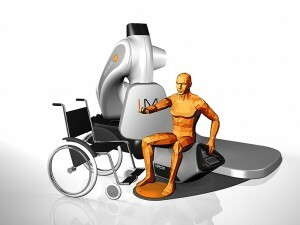 To enable the patient to sit on the therapy seat, the robot moves to the so-called Transfer Position, which makes it easy and safe to lift the patient from the wheelchair and to turn him/her to sit on the robot’s seat; the rotating plate integrated into the device supports the therapist in completing this task. The respective heights for Transfer and Therapy Position may be stored for each patient individually. 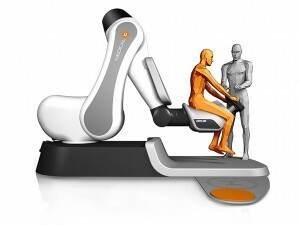 This enables the patient to be transferred safely and quickly onto and from the robot, as well as for therapy to be given at a height which is comfortable for each individual patient. Essentially, a therapy session involving the hirob is indicated for all pathologies causing trunk instability. A clinical study also confirmed very positive effects in patients suffering from neurological deficits, e.g. after a stroke or traumatic brain injury. This therapy has also led to very positive results in patients with multiple sclerosis and children with cerebral palsy. Other potential fields of application for the hirob include patients suffering from Parkinson’s disease, paraplegia or orthopedic diseases. Clinical studies which attest positive effects in patients with these pathologies are currently being planned. Therapy involving the hirob is feasible during almost the full duration of rehabilitation. Therapy may be started when the patient no longer needs artificial respiration. As the speed and intensity of the therapy movement is continuously adjustable, patients may already receive treatment at an early stage of rehabilitation. Currently, the hirob is mainly used during in-patient rehabilitation treatment for patients with a stable circulatory system. In addition, regular therapy involving the hirob during outpatient follow-up treatment may lead to improvements in patients.